It's absolutely disgusting how crowded Taverly druids are, at least 2 people every world. Simply because it's crowded I don't want to run it for very long, I'll wait until off peak. When using melee, it becomes extremely obvious you're a bot when you don't change target quickly after the target is attacked by someone else. 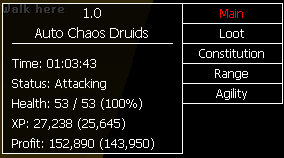 Mainly because the druids are so low HP, you're constantly running around finding a new target. Probably best to use range to avoid this. The selected loot tab always resets the Rare loot table into Selected loot, but sapphires and emeralds are worth so little I want them deselected. Constitution is called Hitpoints in OSRS. Other than that, really cool paint, I like how it shows new tabs as you gain experience. Someone is running a bot farm there. It's obvious it's a bot farm because every single one of them is wearing the exact same thing (full mith, rune boots, addy plate, rune scim). Chaos Druid Tower is much less crowded. I was there for ~2 hours by myself. It will switch targets as soon as it realizes the target is in combat with someone else. 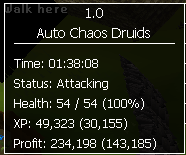 Though, it's based on the druid attacking someone else - so it could be as slow as a game tick (other player attacks, game tick delay before druid retaliates). I can tweak this slightly to be more responsive. Thanks. I wrote it for Auto Fighter a long time ago. I've been meaning to redesign it but just never got around to it. Edit: by "a long time ago", it looks like it was 4 years ago this week. I just updated the script with my new paint framework. It adds tabs to keep it a little more compact. This won't seem to run when I dont want to use food? Goes to the bank and says I am out of items even if I select 0! Take 1 food. I'll fix it later. 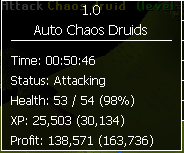 Yeah thats what I assumed would be the best fix, Avoiding the chaos tower for a little bit while I wait for the bot farm to leave! Also doesn't use the agility shortcut on, don't know if I have to set that or not? Selects to run to the log and then when it gets close clicks to run on the other side, which means it doesn't try to cross the log, just runs around? Not a massive issue just running now! Otherwise seems pretty flawless, will mention any other issues I see! Pushed a fix just now. You can select "None" for your food and it will be fine. The agility obstacle is in there, but sometimes it will misclick and end up over the river or the pathfinding will calculate the tile just passed the obstacle as its next step and click there. Bro you need to make more of this bots, i have alote of ideas tht you only need to build without the homework.You really need to contact me fam xsgbeats@gmail.com!! Please we have to talk! Good the Bot to a not this to its greater operation!?. Why not activate! I try to activate it in the falador bank and it does not work! For some reason the script won't run. I've tried re downloading powerboat and restarting it ETC. It won't work. It does seems to work at first but it needs to have 1 food on inventory and teleport tablets. After going to the bank the first time, it didn't took the teleport tablets (I had 53 on the inventory at first, then it banked it, and never withdrawed). It didn't took water runes neither. It returned to the dungeon and kept fighting, obviously it couldn't teleport when the inventory was full again. 2nd edit: Ran the script from zero a second time. After missing the bank's location, It stood in front of the bank doing nothing. normaly this script is banking, but after Rs7071 update of powerpot its not banking anymore, can you update the script? 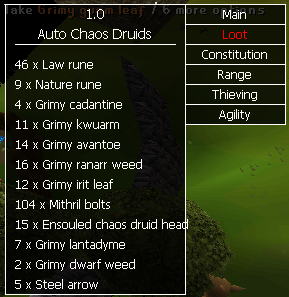 doesn't cross agility log ? script not working. options screen opens then hit start and sits there. Good afternoon i cannot bank with this script ?? Why?? everything works fine attacking looting only wanted items etc but when it reaches the bank it just stays there and if it does work it will put my teleports in bank too..???? how to make it take 1 teleport and 1 food out and leave again?? please fix this!!!!!!!!!!!! GREAT SCRIPT!!!!!!!!! !